In May 1933, Nazi Deputy Führer Rudolf Hess gave German immigrant and German Nazi Party member Heinz Spanknöbel authority to form an American Nazi organization. Shortly thereafter, with help from the German consul in New York City, Spanknöbel created the Friends of New Germany by merging two older organizations in the United States, Gau-USA and the Free Society of Teutonia, which were both small groups with only a few hundred members each. The FoNG was based in New York City but had a strong presence in Chicago. Members wore a uniform, a white shirt and black trousers for men with a black hat festooned with a red symbol. Women members wore a white blouse and a black skirt. The organization led by Spanknöbel was openly pro-Nazi, and engaged in activities such as storming the German language New Yorker Staats-Zeitung with the demand that Nazi-sympathetic articles be published, and the infiltration of other non-political German-American organizations. One of the Friends early initiatives was to counter, with propaganda, the Jewish boycott of German goods, which started in March 1933 to protest Nazi anti-Semitism. In an internal battle for control of the Friends, Spanknöbel was ousted as leader and subsequently deported in October 1933 because he had failed to register as a foreign agent. At the same time, Congressman Samuel Dickstein, Chairman of the Committee on Naturalization and Immigration, became aware of the substantial number of foreigners legally and illegally entering and residing in the country, and the growing anti-Semitism along with vast amounts of anti-Semitic literature being distributed in the country. This led him to investigate independently the activities of Nazi and other fascist groups, leading to the formation of the Special Committee on Un-American Activities Authorized to Investigate Nazi Propaganda and Certain Other Propaganda Activities. Throughout the rest of 1934, the Committee conducted hearings, bringing before it most of the major figures in the American fascist movement. Dickstein's investigation concluded that the Friends represented a branch of German dictator Adolf Hitler's Nazi Party in the United States. The organization existed into the mid-1930s, although it always remained small, with a membership of between 5,000 and 10,000, consisting mostly of German citizens living in the United States and German emigrants who only recently had become citizens. In December 1935, Rudolf Hess ordered all German citizens to leave the FoNG and recalled all of its leaders to Germany. 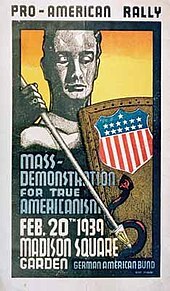 On March 19, 1936, the German American Bund was established as a follow-up organization for the Friends of New Germany in Buffalo, New York. The Bund elected a German-born American citizen Fritz Julius Kuhn as its leader (Bundesführer). Kuhn was a veteran of the Bavarian infantry during World War I and an Alter Kämpfer (old fighter) of the Nazi Party who, in 1934, was granted American citizenship. Kuhn was initially effective as a leader and was able to unite the organization and expand its membership but came to be seen simply as an incompetent swindler and liar. The administrative structure of the Bund mimicked the regional administrative subdivision of the Nazi Party. The German American Bund divided the United States into three Gaue: Gau Ost (East), Gau West and Gau Midwest. Together the three Gaue comprised 69 Ortsgruppen (local groups): 40 in Gau Ost (17 in New York), 10 in Gau West and 19 in Gau Midwest. Each Gau had its own Gauleiter and staff to direct the Bund operations in the region in accordance with the Führerprinzip. The Bund's national headquarters was located at 178 East 85th Street in the New York City borough of Manhattan. The Bund established a number of training camps, including Camp Nordland in Sussex County, New Jersey, Camp Siegfried in Yaphank, New York, Camp Hindenburg in Grafton, Wisconsin, Deutschhorst Country Club in Sellersville, Pennsylvania, Camp Bergwald in Bloomingdale, New Jersey, and Camp Highland in New York state. The Bund held rallies with Nazi insignia and procedures such as the Hitler salute and attacked the administration of President Franklin D. Roosevelt, Jewish-American groups, Communism, "Moscow-directed" trade unions and American boycotts of German goods. The organization claimed to show its loyalty to America by displaying the flag of the United States alongside the flag of Nazi Germany at Bund meetings, and declared that George Washington was "the first Fascist" who did not believe democracy would work. Kuhn and a few other Bundmen traveled to Berlin to attend the 1936 Summer Olympics. During the trip, he visited the Reich Chancellery, where his picture was taken with Hitler. This act did not constitute an official Nazi approval for Kuhn's organization: German Ambassador to the United States Hans-Heinrich Dieckhoff expressed his disapproval and concern over the group to Berlin, causing distrust between the Bund and the Nazi regime. The organization received no financial or verbal support from Germany. In response to the outrage of Jewish war veterans, Congress in 1938 passed the Foreign Agents Registration Act requiring foreign agents to register with the State Department. On March 1, 1938, the Nazi government decreed that no Reichsdeutsche [German nationals] could be a member of the Bund, and that no Nazi emblems were to be used by the organization. This was done both to appease the U.S. and to distance Germany from the Bund, which was increasingly a cause of embarrassment with its rhetoric and actions. Arguably, the zenith of the Bund's activities was the rally at Madison Square Garden in New York City on February 20, 1939. Some 20,000 people attended and heard Kuhn criticize President Roosevelt by repeatedly referring to him as "Frank D. Rosenfeld", calling his New Deal the "Jew Deal"[dubious – discuss] and denouncing what he believed to be Bolshevik-Jewish American leadership. Most shocking to American sensibilities was the outbreak of violence between protesters and Bund storm troopers. The rally, which attracted 20,000 Nazi supporters, was the subject of the 2017 short documentary A Night at the Garden by Marshall Curry. In 1939, a New York tax investigation determined that Kuhn had embezzled $14,000 from the Bund. The Bund did not seek to have Kuhn prosecuted, operating on the principle (Führerprinzip) that the leader had absolute power. However, New York City's district attorney prosecuted him in an attempt to cripple the Bund. On December 5, 1939, Kuhn was sentenced to two and a half to five years in prison for tax evasion and embezzlement. New Bund leaders replaced Kuhn, most notably Gerhard Kunze, but only for brief periods. A year after the outbreak of World War II, Congress enacted a peacetime military draft in September 1940. The Bund counseled members of draft age to evade conscription, a criminal offense punishable by up to five years in jail and a $10,000 fine. Gerhard Kunze fled to Mexico in November 1941. U.S. Congressman Martin Dies (D-Texas) and his House Committee on Un-American Activities were active in denying any Nazi-sympathetic organization the ability to operate freely during World War II. In the last week of December 1942, led by journalist Dorothy Thompson, fifty leading German-Americans (including baseball icon Babe Ruth) signed a "Christmas Declaration by men and women of German ancestry" condemning Nazism, which appeared in ten major American daily newspapers. While Kuhn was in prison, his citizenship was canceled on June 1, 1943. Upon his release after 43 months in state prison, Kuhn was re-arrested on June 21, 1943, as an enemy alien and interned by the federal government at a camp in Crystal City, Texas. After the war, Kuhn was interned at Ellis Island and deported to Germany on September 15, 1945. He died on December 14, 1951, in Munich, Germany. ^ a b Federal Bureau of Investigation. "German American Federation/Bund Part 11 of 11". FBI Records: The Vault. ^ "American Nazi organization rally at Madison Square Garden, 1939". Rare Historical Photos. February 19, 2014. ^ "German American Bund". Holocaust Encyclopedia. July 2, 2016. ^ Chip Berlet, Matthew Nemiroff Lyons (2000). Right-Wing Populism in America: Too Close for Comfort. Guilford Press. ISBN 978-1-57230-562-5. ^ Shaffer, Ryan (Spring 2010). "Long Island Nazis: A Local Synthesis of Transnational Politics". 21 (2). Journal of Long Island History. Archived from the original on June 21, 2010. Retrieved November 19, 2010. ^ "Fritz Kuhn Death in 1951 Revealed. Lawyer Says Former Leader of German-American Bund Succumbed in Munich". Associated Press in New York Times. February 2, 1953. Retrieved 2008-07-20. Fritz Kuhn, once the arrogant, noisy leader of the pro-Hitler German-American Bund, died here more than a year ago – a poor and obscure chemist, unheralded and unsung. ^ Cyprian Blamires; Paul Jackson (2006). World fascism: a historical encyclopedia, Volume 1. ABC-CLIO. p. 270. ISBN 0-8223-0772-3. ^ a b c Cornelia Wilhelms (1998). Bewegung oder Verein? : nationalsozialistische Volkspolitik in dem USA. Franz Steiner Verlag. p. 167. ISBN 3-515-06805-8. ^ a b "German-American Bund". Encyclopædia Britannica. Retrieved February 5, 2012. ^ "German films about Camp Bergwald, the Bund Camp on Federal Hill, Riverdale, NJ". Motion Picture, Sound, and Video Branch (NWDNM), National Archives. Retrieved February 5, 2012. ^ Jackson, Kenneth T. The Encyclopedia of New York City. The New York Historical Society, Yale University Press, 1995, 462. ^ Birchall, Guy (September 12, 2017). "Inside Hitler's terrifying AMERICAN summer camps where US boys were taught twisted Nazi ideology and trained to shoot, march and salute". TheSun.co.uk. Retrieved September 12, 2017. ^ Patricia Kollander; John O'Sullivan (2005). "I must be a part of this war": a German American's fight against Hitler and Nazism. Fordham Univ Press. p. 37. ISBN 0-8232-2528-3. ^ "Nazis Hail George Washington as First Fascist". Life. 1938-03-07. p. 17. Retrieved November 25, 2011. ^ "Bund Activities Widespread. Evidence Taken by Dies Committee Throws Light on Meaning of the Garden Rally". New York Times. February 26, 1939. Retrieved 2015-02-19. Disorders attendant upon Nazi rallies in New York and Los Angeles this week again focused attention upon the Nazi movement in the United States and inspired conjectures as to its strength and influence. ^ Buder, Emily (10 October 2017). "When 20,000 American Nazis Descended Upon New York City". The Atlantic. Retrieved 6 December 2017. 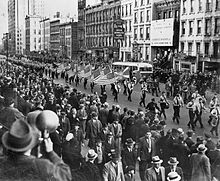 In 1939, the German American Bund organized a rally of 20,000 Nazi supporters at Madison Square Garden in New York City. ^ Adams, Thomas (2005). Germany and the Americas: Culture, Politics, and History: A MultiDisciplinary Encyclopedia. G – N, volume 2. ABC-CLIO. p. 631. ISBN 1-85109-628-0. Retrieved January 11, 2011. ^ a b "Fritz Kuhn, Former Bund Chief, Ordered Back to Germany". The Evening Independent. September 7, 1945. Allen, Joe, "'It Can't Happen Here? ': Confronting the Fascist Threat in the US in the Late 1930s," International Socialist Review, Part One: whole no. 85 (Sept.-Oct. 2012), pp. 26–35; Part Two: whole no. 87 (Jan.-Feb. 2013), pp. 19–28. Diamond, Sander. The Nazi Movement in the United States: 1924–1941. Ithaca: Cornell University, 1974. Van Ells, Mark D. (August 2007). Americans for Hitler – The Bund. America in WWII. 3. pp. 44–49. Retrieved May 13, 2016. Wikimedia Commons has media related to German American Bund. Home Grown Nazis - A 13 part series for the Chicago Times in Sept. 1937 on Nazi activities in Chicago based on undercover reporting of Chicago Times reporters. Materials produced by the Bund are found in the Florence Mendheim Collection of Anti-Semitic Propaganda (#AR 25441); Leo Baeck Institute, New York. "A Night at the Garden". Field of Vision. 11 October 2017. Retrieved 6 December 2017.